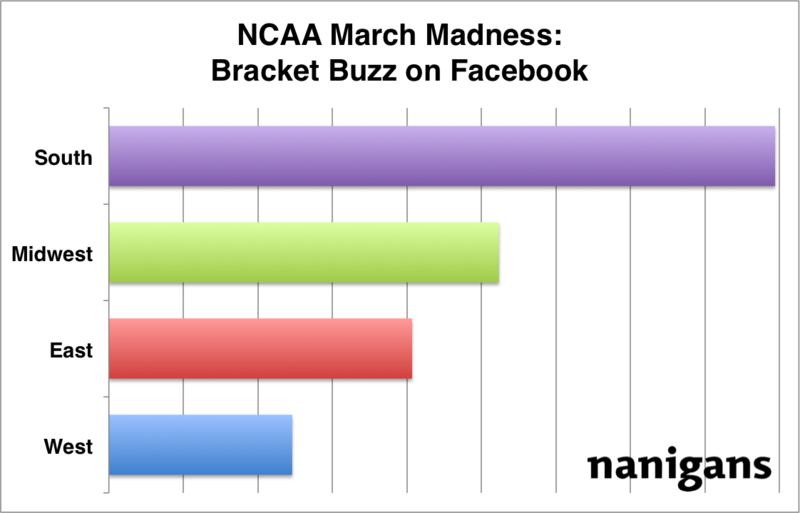 NCAA March Madness on Facebook: Which Bracket is Most Popular? March Madness has arrived—the time when Bracketology becomes an accepted form of science. Analysts and fans alike continue their last minute dissections, searching for something that could signal an upset (we’re looking at you Syracuse). Users of Facebook are no different, taking to the platform in hordes to discuss each team and hurl a few well placed insults at their peers from other schools. Freecast has taken advantage of the interest on Facebook, and partnered with TNT, TBS, TruTV and CBS to stream all the games live onto Facebook. So, who is interested in March Madness on Facebook? We dove into our Facebook campaign data to find out. When comparing interest on Facebook in each regional bracket, we found some large differences. The Southern bracket, anchored by heavyweights like Kentucky, Duke and last year’s champion UConn, led the field in reach. This was followed by the Midwestern region with UNC and Kansas, the Eastern region, with Syracuse and Ohio state, and lastly the Western bracket with Michigan State and Missouri. Though the Southern bracket has captured the interest of the Facebook community, it’s anyone’s guess as to whether we’ll see a representative in the championship game—regardless that the President seems to think so. 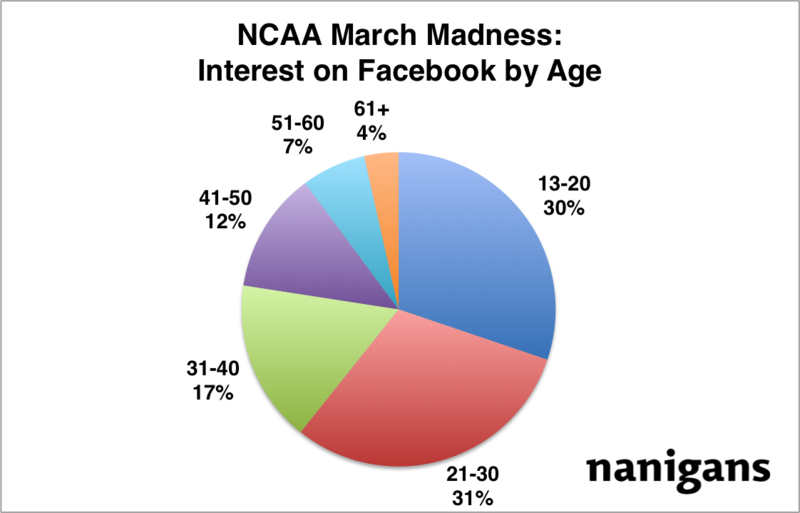 Breaking down interest in March Madness on Facebook by age, it is pretty clear that March Madness is not just for college students. Though 13-30 year olds dominate the buzz on Facebook, users over the age of 30 represent nearly 40% of the total interest. 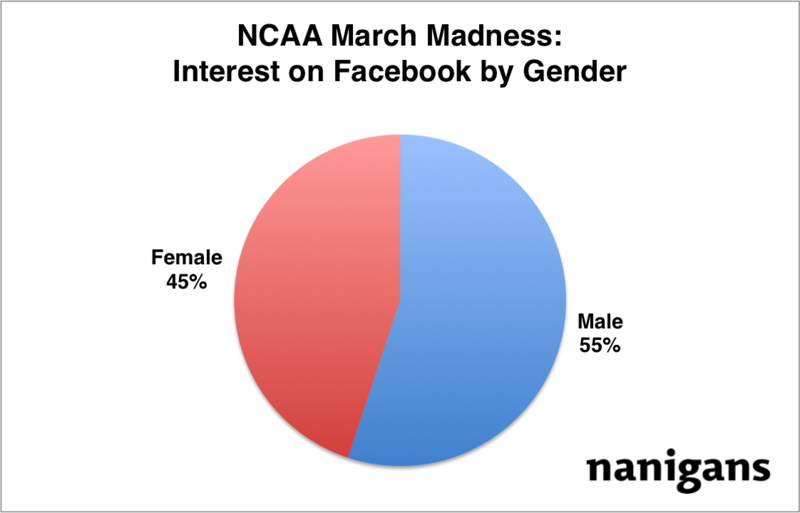 Next we took a look at the gender composition of those interested in March Madness. Looking at the demographics below, it is evident that March Madness has captured the interest of both men and women. While men tend to be slightly more interested—they outpace women by 10%—March Madness and its bracketology is clearly not just a man’s game. Does anything in the data surprise you? Who do you think will win the tournament? Let us know in the comments!